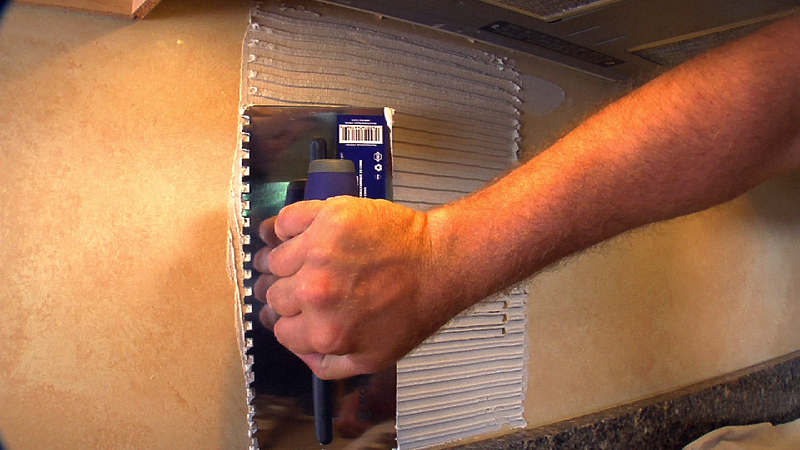 By now, you have a good idea of how to cut and lay out tile for your tile backsplash. Now, it's time to mix your mortar and start installing a tile backsplash. After consulting your mortar’s label, carefully mix it. Then, using the flat edge of the trowel, scoop some mortar out of the bucket and apply it to the wall. Starting at the vertical centerline of your backsplash, use the long, flat edges of your trowel to spread the mortar outward in a sweeping motion. er area. If you spread the mortar over too large of an area, a skin might form on its surface before you can set your tiles. And if that happens, you will need to stop setting, scrape the wall clean and apply a fresh coat of mortar. Aft er you’ve applied mortar on about 10 square feet of your substrate, comb through it with the notched side of your trowel, forming a 45-degree angle between your trowel and the wall. Comb in straight, even lines parallel to the counter. 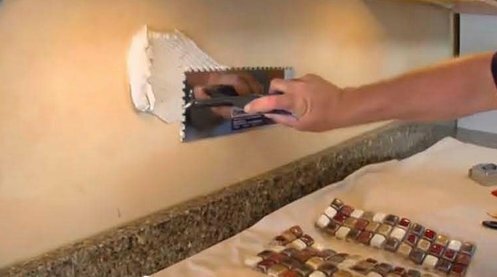 Don’t be afraid to apply some pressure to your trowel. If you hear the trowel scraping the wall through the mortar bed, you’re doing it right! As you’re mortaring, make sure that you leave your vertical centerline visible. You’re not done with it just yet! If you carefully laid out your tile, bonding the tile to the section you’ve mortared should be simple. Start laying tile at the bottom of the vertical centerline – leaving 1/8 inch between the bottom of the first tile and the counter edge for a movement joint. Press the tile firmly into the mortar with a slight twisting motion and work upward and outward. Avoid sliding the tile into place. If your tiles are not self-spacing, place spacers between them, both horizontally and vertically, to maintain even grout joints. 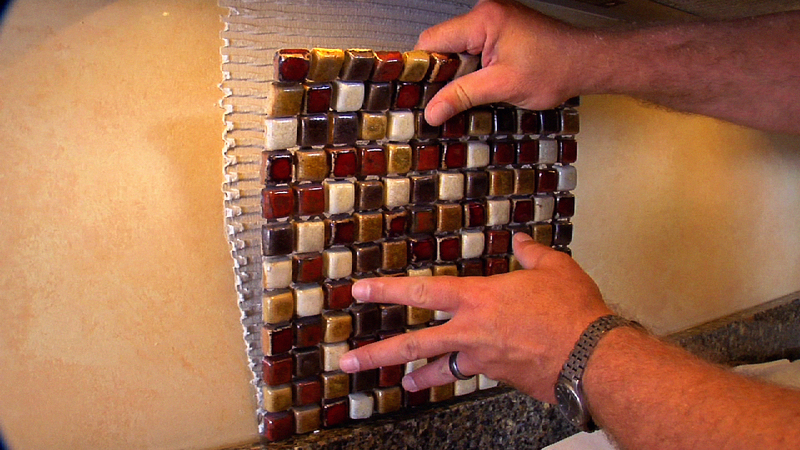 Once you reach the end of the backsplash, begin laying tile in the opposite direction from the centerline. No matter how “in the zone” you get, periodically take a step back from your backsplash to make sure your rows of tile are level. If you’re working with sheet tile (featured in above picture), apply each mesh-backed sheet by unfurling it, starting from the bottom row, and remembering to leave space for a movement joint. If the sheet tile is glass, press it firmly into the mortar bed – removing any air bubbles – and make sure 100% of the back of the glass tile is covered with mortar. If your tile has a paper facing, soak it to remove before grouting tile. Follow instructions on the mortar bag regarding its wait time. If you’re setting tile in an especially cold or humid environment or over existing tile or laminate, allow more time for the tile to set before grouting. Similarly, larger porcelain and glass tiles also have extended set times. After the backsplash mortar has been laid and the tiles installed, the next step on the path to a great backsplash tile installation is to grout the backsplash. I'll be doing a lot of cutting around switch boxes and am concerned about the amount of time I'll have to work before the mastic "skins". Any idea how much working time I can expect. Hi Michael. I recommend only applying the amount of adhesive to the surface that can be tiled over in 15 minutes.This time may vary depending on the temperature and the substrate, but 15 minutes is a good rule of thumb. If skin starts to form on the mastic, do not set the tile. Remove the mastic entirely and reapply. Hope that answers your questions!